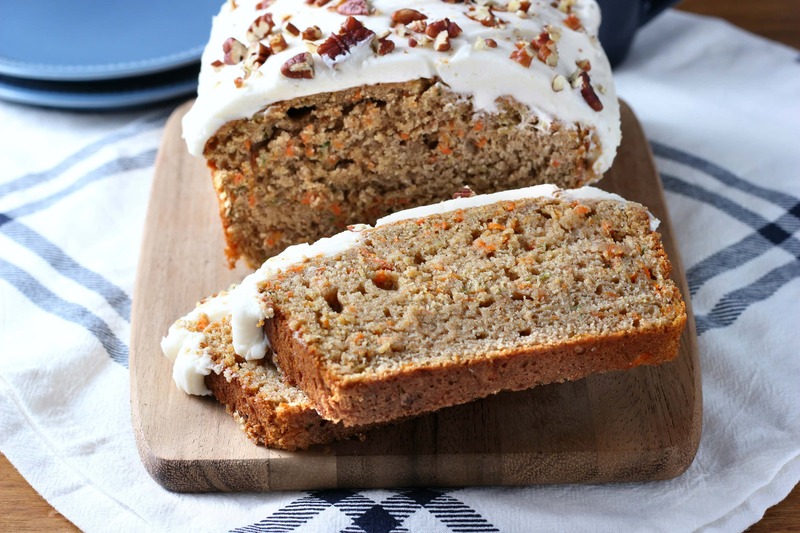 This Zucchini Carrot Cake Bread is filled with the warm spices of cinnamon, nutmeg, and allspice to give you the traditional flavor of carrot cake, so you don’t even notice the zucchini. A great way to sneak in that green veggie! 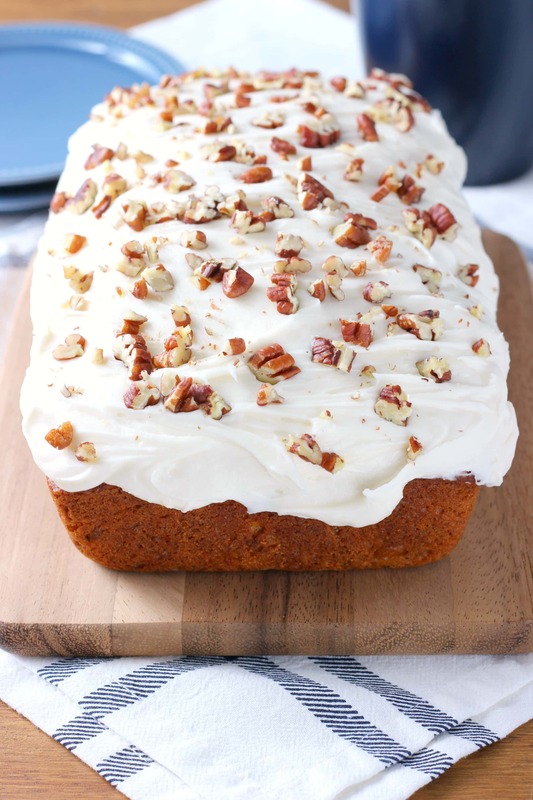 It’s also topped with a generous layer of cream cheese frosting and a sprinkling of crunchy pecans! A couple of weeks ago we were talking with our neighbor about our garden and the inevitable surplus of zucchini that comes this time of year. He mentioned that he had recently had a zucchini carrot bread that was really good. As soon as he said it, I started thinking about how I could turn my carrot cake bread into a zucchini carrot cake bread! It took me awhile, but I finally got around to giving it a try. The result was carrot cake in bread form with extra moisture from shredded zucchini. The warm spices of cinnamon, nutmeg, and allspice give you the traditional flavor of carrot cake, so you don’t even notice the zucchini. A great way to sneak in that green veggie! 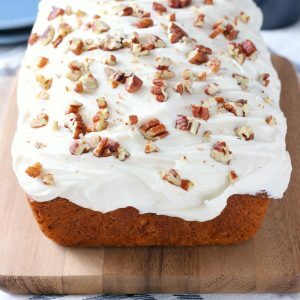 Since you can’t have carrot cake without cream cheese frosting, this bread is topped with a generous layer! 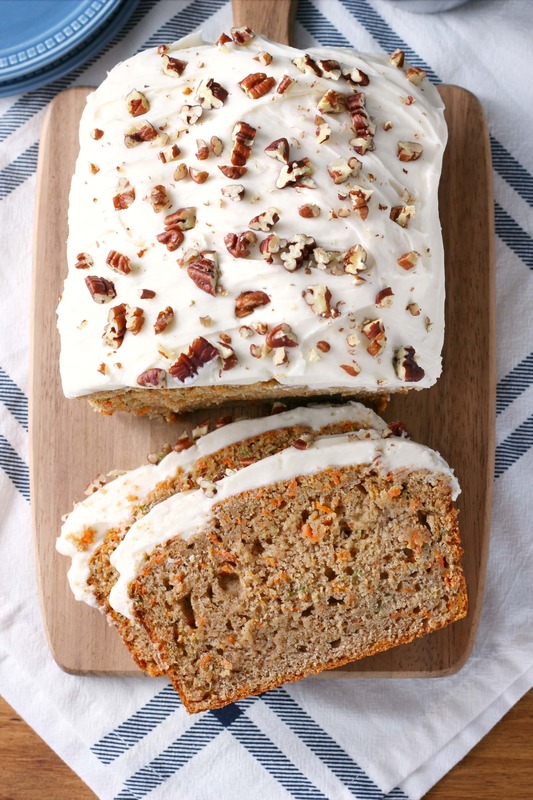 A sprinkling of chopped pecans adds a bit of crunch and rounds out the traditional carrot cake flavor. With it being a bread, you don’t have to wait until dessert to have a piece. Cut a thick slice for breakfast, and start your morning off on a delicious note! In a small bowl, whisk together flours, baking powder, baking soda, salt, cinnamon, nutmeg, allspice, and brown sugar. In a large bowl, whisk together egg, vanilla extract, yogurt, melted coconut oil, and milk. Add dry ingredients to wet ingredients and stir until just combined. Stir in shredded carrots and shredded zucchini. Pour batter into prepared loaf pan. Bake for 35-45 minutes or until toothpick inserted in the center comes out clean. Check bread at 30 minutes and if top is getting brown, cover with aluminum foil for the remainder of the baking time. While bread is cooling, prepare frosting. Beat together cream cheese and butter until creamy. Beat in confectioner's sugar until smooth. Spread frosting over cooled bread. Sprinkle with chopped pecans. I love zucchini cake. Tis the season! What a beautiful loaf of bread and a wonderful way to use up that zucchini that seems to be everywhere this time of year! I need this in my life. That thick layer of frosting has me drooling! Love the combination you’ve done here with the zucchini and carrot! It looks so delicious! Holy guacamole! From the top to the very bottom, this is amazing! 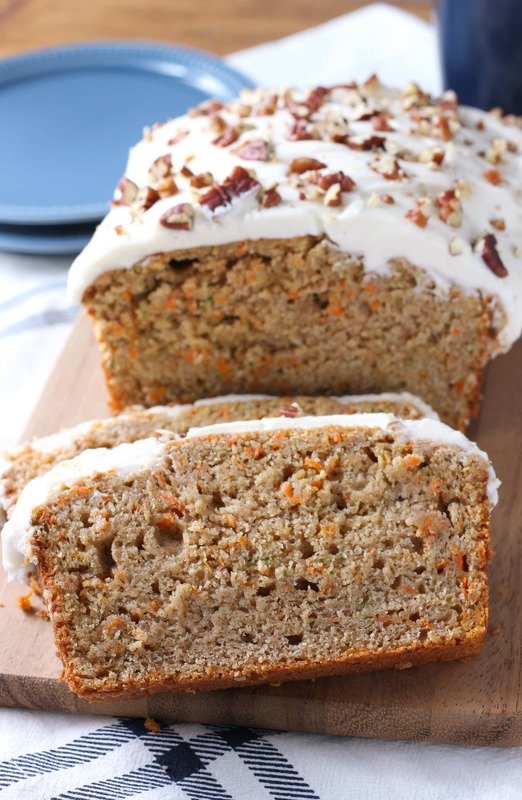 Love the combo of carrot cake & zucchini bread — super idea! My neighbour keeps giving me buckets of courgettes so I will definitely be trying this! I love the idea of “dessert” for breakfast! Carrot cake is my absolute favorite and yes I can only spiralize so many zucchinis.